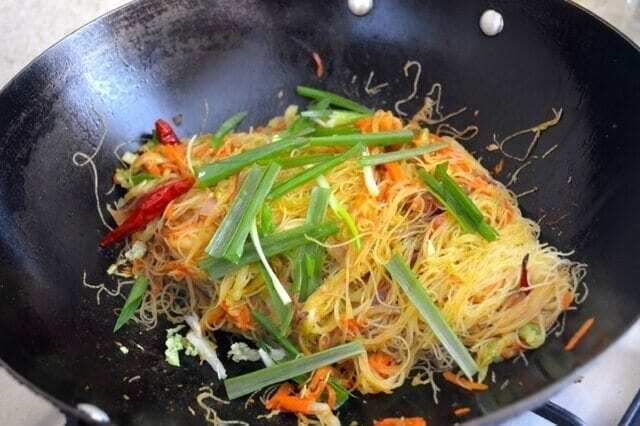 One of the most popular dishes on any Chinese take-out menu is Singapore Noodles, or Singapore Mei Fun or sometimes spelled Singapore Mai Fun. 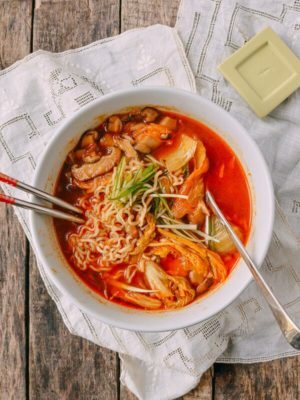 Now, I’ve met people from Singapore who are pretty bewildered when they come to the US and see their country’s moniker attached to this dish of noodles and curry. I’m not entirely sure what makes it Singaporean, just like I’m not sure what makes an egg roll Chinese. 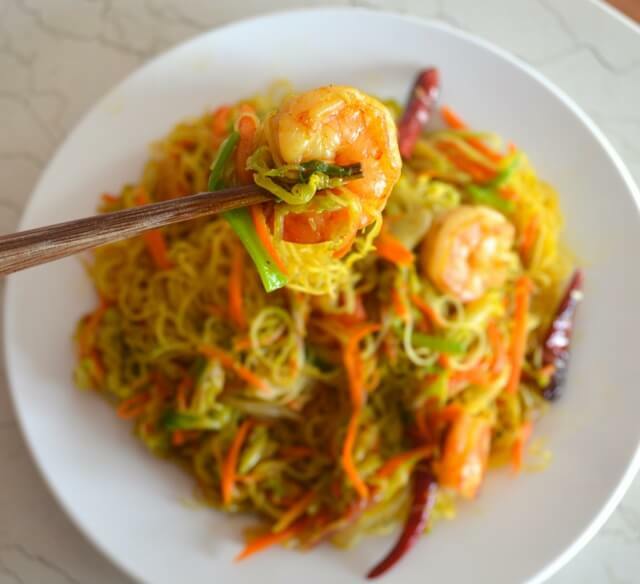 But as with many things on a Chinese takeout menu…fuzzy origins aside, it still tastes good and we all identify with and enjoy a good Singapore noodles recipe! You can find the curry powder and rice noodles in the Chinese grocery store. 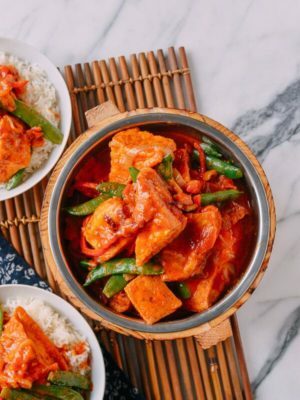 If you’re not that into curry, check out our Xiamen Chow Mei Fun recipe, which is a similar recipe without the curry powder! Rinse the shrimp and pat dry. 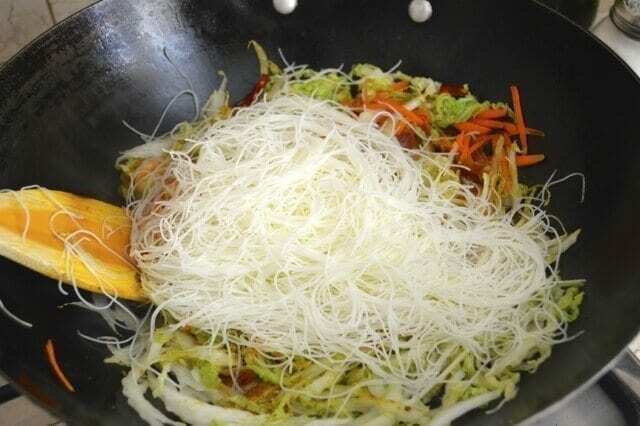 Soak the rice noodles in cold water for twenty minutes. Drain the noodles just before you’re ready cook the dish. 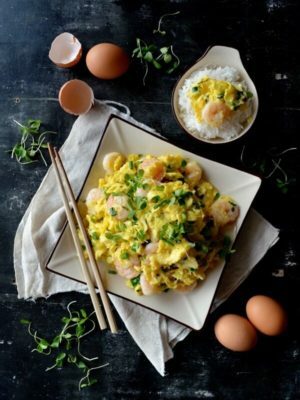 We forgot to add the eggs, so they’re not pictured, but if you decide to use eggs in this Singapore noodles dish (which we highly recommend), beat them in a bowl and make a thin omelet. Transfer to the cutting board and cut the omelet into thin strips about 2 to 3 inches long and set aside. Julienne the napa cabbage, carrot, and scallion. Thinly slice the red onion and set aside along with the dried chili peppers. 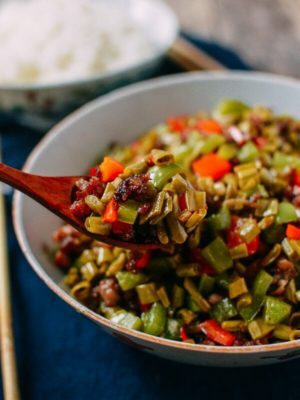 Cut the Chinese sausage into thin pieces similar to the size of the carrots. 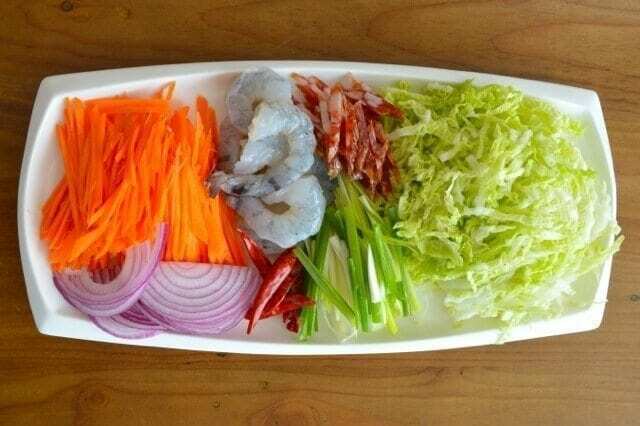 If you haven’t noticed yet, everything in Chinese dishes should be cut into the same shape. This is a noodle dish, so everything (except the shrimp of course) must be in thin strips to match the shape of the noodles. Heat the wok on the highest setting and add oil, sausage and shrimp and stir-fry for about 10 seconds. Add the dried chili peppers, carrot and onion and stir-fry for about 30 seconds. 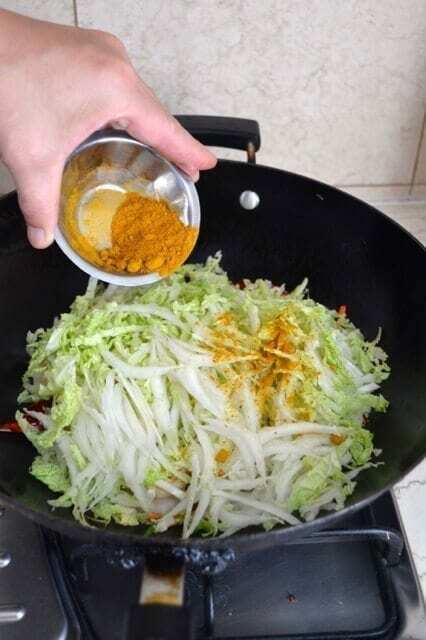 Add the napa cabbage and then sprinkle the curry powder evenly over the mixture. 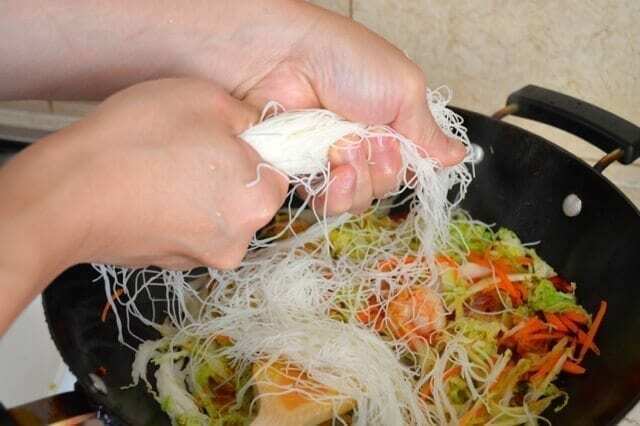 Add the rice noodles and while doing so, make sure you rip them into manageable 7 to 8 inch lengths for easy eating later. Add the salt and wine now and mix well (about 1 to 2 minutes), making sure you firmly scrape the bottom of the wok with your spatula to prevent the noodles from sticking. A hot wok is a must to prevent sticking, but ensuring that you scrape the bottom of the wok as you mix is an important technique. 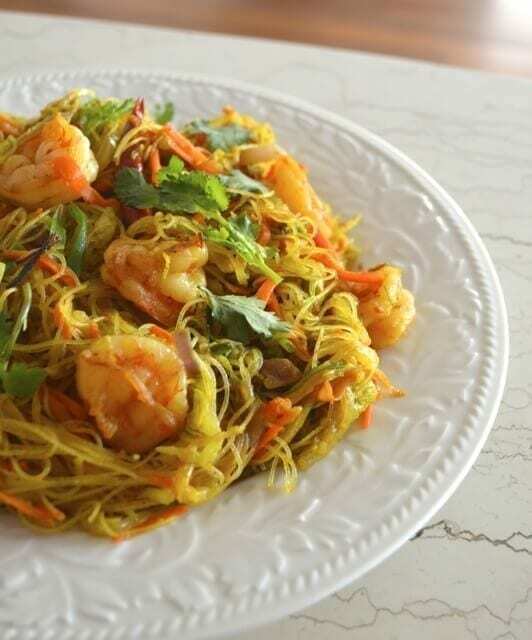 The rice noodles should be taking on the rich color of the curry powder. Add the sesame oil, soy sauce, white pepper, scallions and the cooked egg if you decided to include it. Mix thoroughly again for another minute, plate and serve immediately! Rinse the shrimp and pat dry. 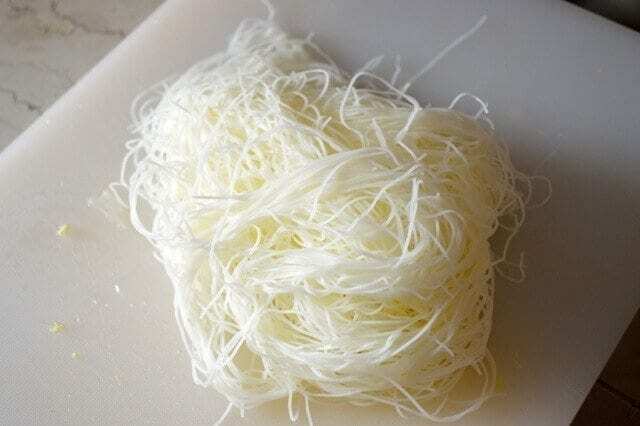 Soak the rice noodles in cold water for twenty minutes. Drain the noodles just before you’re ready cook. If you decide to use eggs in this, beat them in a bowl and make a thin omelet. Transfer to the cutting board and cut the omelet into thin strips about 2 to 3 inches long and set aside. Julienne the napa cabbage, carrot, and scallion. Thinly slice the red onion and set aside along with the dried chili peppers. 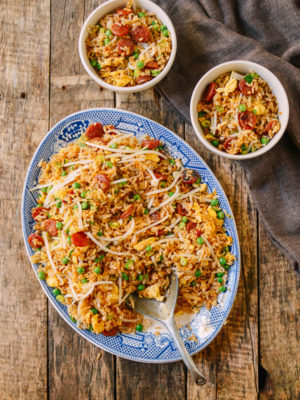 Cut the Chinese sausage into thin pieces similar to the size of the carrots. Heat the wok on the highest setting and add oil, sausage and shrimp and stir-fry for about 10 seconds. 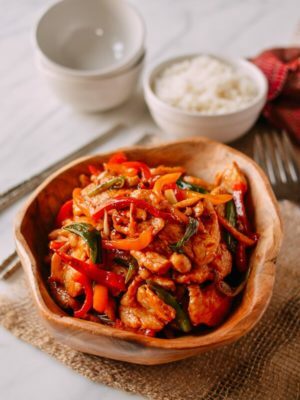 Add the dried chili peppers, carrot, napa cabbage and onion and stir-fry for about 30 seconds and then sprinkle the curry powder evenly over the mixture. 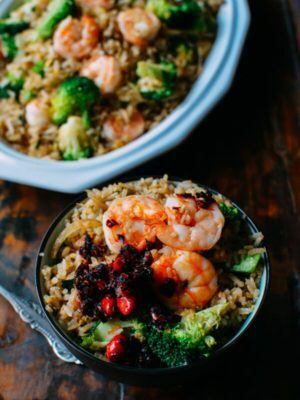 Add the rice noodles and while doing so, make sure you rip them into manageable 7 to 8 inch lengths for easy eating later. Add the salt and wine and mix well (about 1 to 2 minutes), making sure you firmly scrape the bottom of the wok with your spatula to prevent the noodles from sticking. A hot wok is a must to prevent sticking but ensuring that you scrape the bottom of the wok as you mix is an important technique. The noodles should be taking on the rich color of the curry powder. Add the sesame oil, soy sauce, white pepper, scallions and the cooked egg if you decided to include it. Mix thoroughly again for another minute, plate and serve immediately! 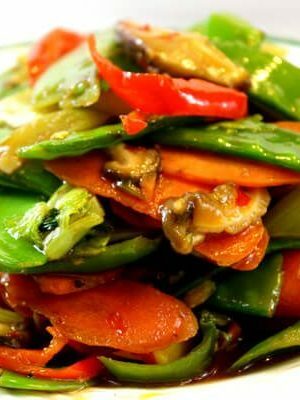 Bonjour Sarah, je voudrais faire votre recette de nouilles Singapour car ça a l’air vraiment très bon, mais pouvez-vous me dire quelle variété de piments séchés vous mettez dans la recette. Un bonjour de France. Bonjour Monique! 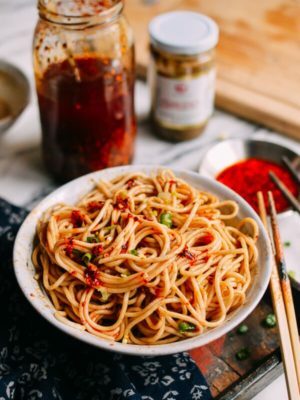 We have a written description of the dried red chili peppers here: https://thewoksoflife.com/chinese-spices-condiments/#red-dried-chili-peppers. Hope that helps! Bonjour Sarah, merci pour votre réponse j’ai trouvé sur Amazon, dès que je reçois ma commande je vais m’empressé de faire votre recette et je sais déjà que l’on va se régalé j’en suis sure. encore un grand merci et bonne journée. 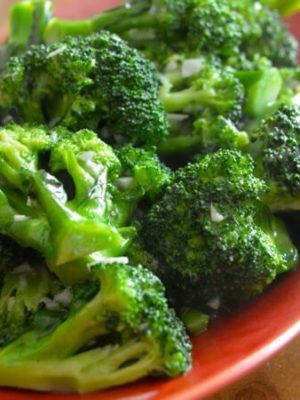 Thank you for another great recipe, better than any restaurant near me! Wow, that looks so good, Jay! I lived in Singapore for 2 years, and true! No Singapore mei fun to be found! Where I think the moniker comes is the beautiful fusion of Asian & Indian, just like the city-state. If they threw in just a little sambal ayam (chicken), it would encompass all of the wonders of this amazingly blended culture! Totally agree with you Terra! 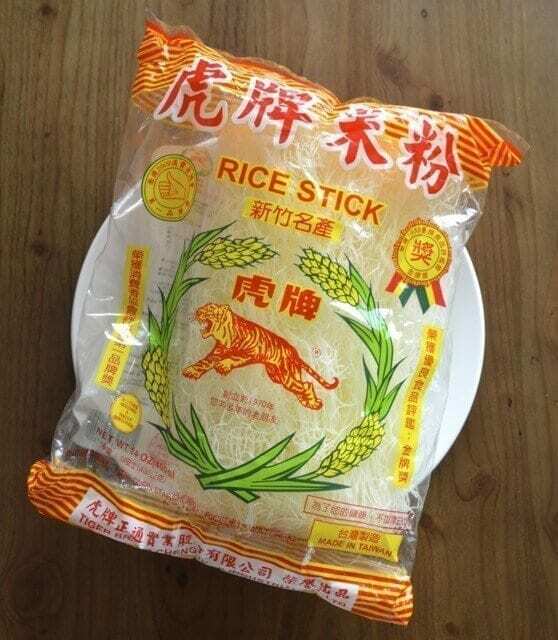 I had some rice noodles and wanted to try them, but I think they were the wrong type. Mine made a long gluey lump when I tried soaking them. I boiled them per the instructions on their package but they were like wet hair. I used my thinnest Lo Mein noodles and the dish came out okay. The flavor is really unique. 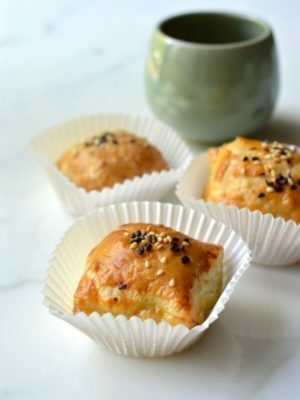 I liked it, but not nearly as much as the other recipes I have tried. Hi Heather, not sure what kind of rice noodles you used. 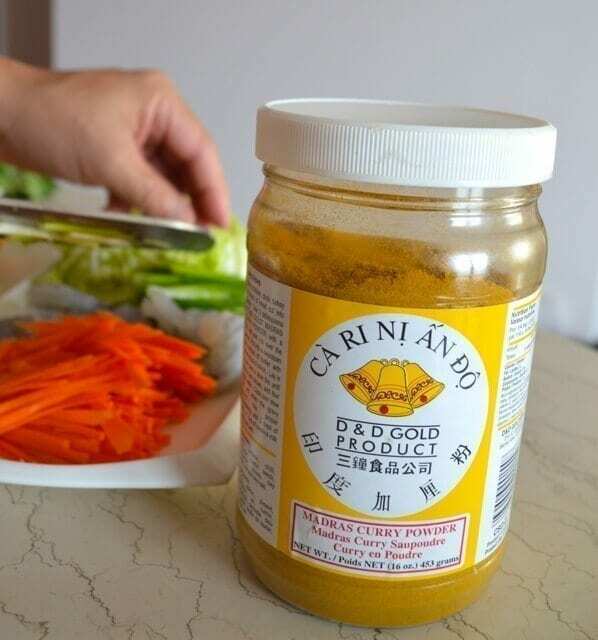 Check out the pictures of the products for the right kind. 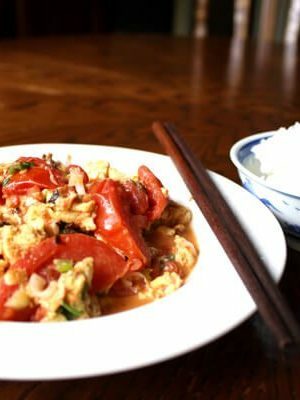 ;-) You have to like curry to like this dish or try our other xiamen mei fun recipe. 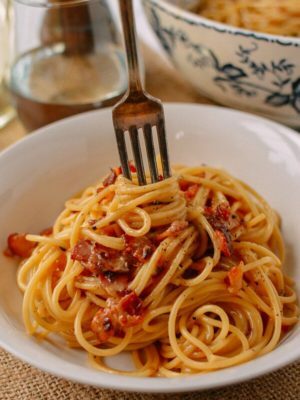 I have a flattop electric stove but want to try your recipes. 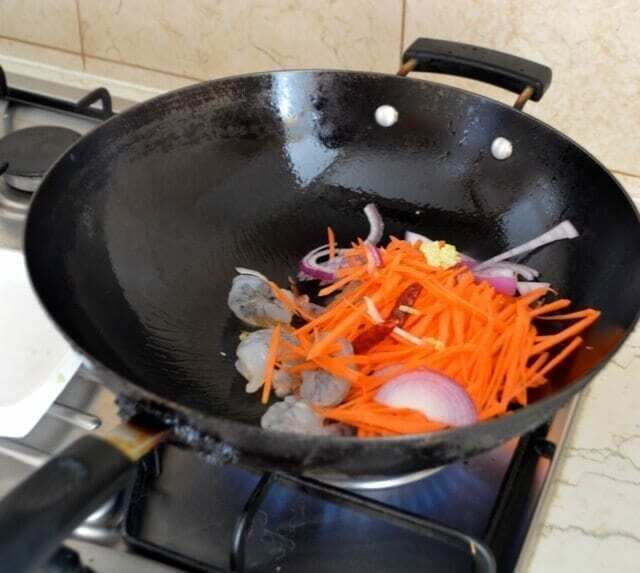 I have several different woks, stainless steel, and non stick however, I don’t have a traditional wok because of the rounded base and because I don’t think it would get hot enough on the flattop surface. Any suggestions? Hi Ava, Carbon steel flat bottomed woks are available and probably best for your electric stove! Thanks! I’m going to purchase one and try a few recipes. Everything looks so good! I hope it gets hot enough. Thanks again! I’ll have to try this. 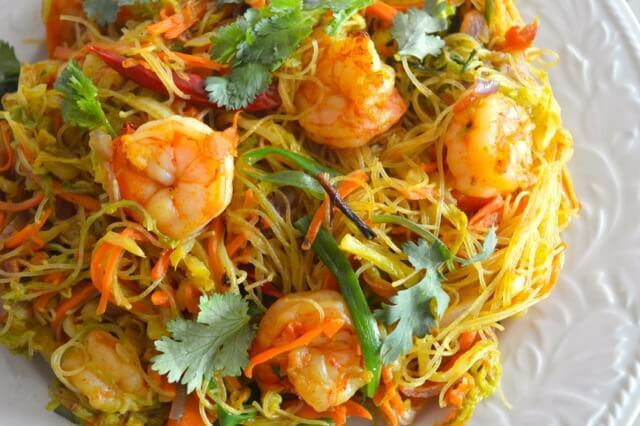 I love the Singapore noodles I’ve had at Chinese restaurants, and have found the Singapore curry powder at Penzey’s. I haven’t tried to duplicate the stir-fry noodles from restaurants but love the Singapore seasoning for ramen or rice.